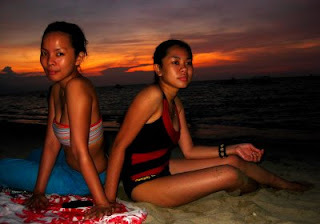 This post is the second of 2 posts about my 2009 summer at Puerto Galera, White Beach in Mindoro. Read the first post here. 2009 Summer is over for the Philippines when it's supposed to be just beginning. (It's only May!!!) Our trip to Puerto Galera (although in retrospect was quite headstrong) would probably be our last summer outing to the beach, or rather, anywhere which requires you to ride a boat to reach the beach. For now, I'll be happy that we got to go to at least one beach this year. :D I love the beach. When I'm filthy rich, which is soon, hehe, I'll buy the whole Boracay Island. Haha! On our second day in Puerto Galera (Sunday), our friends Paolo, Princess & Jenny left early in the morning for Manila because some of them needed to work the next day. Liz, Bing and I agreed to spend the whole day relaxing. As opposed to the first day, we did not make any plans on the second day, we just swam around, slept and walked around the beach. The sun was still strong, and even though the sky was still a bit hazy, you wouldn't think that just a couple of days ago there was a storm here. There was a host of things to do in Puerto Galera: aside from the normal snorkeling and island hopping, diving and swimming, you can also para-sail, kayak, ride a banana boat, hike up the mountains, visit the waterfalls, get a tattoo or a henna tattoo, get piercings, or get a massage on the beach. At night, they have a lot of bars and pubs along the beach coast, most of them play dance music, some with live bands. In the afternoon, while the ladies were taking a nap, I went by myself and walked the length of White Beach. I took my camera and snapped away at the sand, the water, and the people. There was not a lot of people left that day so I got a good relaxing walk. More shopping and more swimming after that, and a massage on the beach at sundown was the perfect way to end the day. 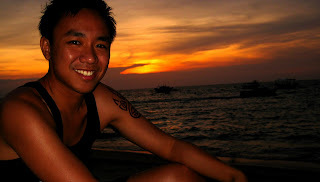 Sunset at Puerto Galera is one to watch out for. It begins like a candle light and then spreads quickly like wildfire across the sky. To me, watching the sun set is a rarity. Often, I come out of the office when it's already dark. A good thing to note to non-Filipino readers is that sunset in the Philippines is very quick. It begins at around 6PM varying depending on the month, and it can be over in as short as 10 minutes. On Monday, we slept in, packed our bags slowly, and made our way to the beach to catch the 12noon boat to Manila. Tudoy (my really kind and good looking friend! hehe!) agreed to pick us up from the Batangas Pier. The trip back took longer than we expected, but we arrived safely nonetheless. I leave you then with a couple more photos of Puerto Galera. You can click on any of the photos to see them in their original size. I love the idea of those beach massages. What a great atmosphere for something so relaxing!